About 30 people found their way to the Eddie C. Lovelace courtroom on the second floor of the Clinton County Courthouse last Thursday morning to greet and hear from State Senator Max Wise. Wise, a Campbellsville Republican, was holding a “town hall” style gathering to report to his constituents about the events that had taken place, and that were expected to be dealt with as the Kentucky legislature holds an even year, short legislative session in Frankfort. Wise, who has been serving as this district’s State Senator since 2015, told those on hand that he expects the Kentucky lawmakers will have a busy session, but since it is a even year session and will only last for 30 days, he didn’t foresee being able to seriously deal with problems such as the failing pension system. Other topics Wise talked about Thursday morning included Welfare Reform and his belief that able bodied people who were receiving welfare assistance, should be required to work on some level in order to receive that assistance. He also noted that on the subject of legalizing sports gambling, he had not been convinced that the state’s budget woes would be helped by passing legislation that would make betting on sports legal in Kentucky. Wise noted that he had been told that legalizing sports betting would produce some $12 million in state revenue, and when comparing that against the $34 billion budget shortfall, he didn’t think it was a viable answer. “I don’t see this as a cure, I don’t see this as a fix and I don’t see this happening in this legislative session.” Wise said. He also noted that most legislatures and lobbyists who were pushing the sports gambling issue were also pushing the idea of profits from the sports gambling industry being used to additionally fund the thoroughbred horse racing industry. Wise said he felt that issues such as tax reform that would eliminate a personal income tax while raising the sales tax percentage, would be a much more effective answer to raising money to answer the state budget shortfall problems. He added that because if would be a short legislative session, he didn’t expect to see any serious pushes to deal with tax reform this time around. Additionally, Wise spoke briefly on other issues that could be addressed such as court reform, medical marijuana, term limits for elected officials and cleaning up the gas tax laws in ways that would more fairly see the money raised better distributed, especially to small communities such as the one he represents in his 16th District. Kentucky State Senator Max Wise spent some time Thursday morning, talking with the constituents who took the time to hear his comments during a “Town Hall” style meeting at the courthouse. 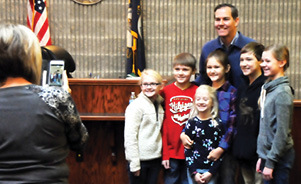 In addition to hearing comments and answering questions, he also took some time after his comments, to pose for a photo opportunity with these young Clinton County citizens from the Jason Warinner and David McIver families. The youngsters, who are home schooled students, were taking advantage of the senator’s appearance as an educational and teaching opportunity.